April 12, 2016, 11:38 a.m.
By Shan Wang @shansquared April 12, 2016, 11:38 a.m.
Around 5 p.m. on April 1, everyone in our little office crowded around my desk, watching a live video of baby goats roaming inside BuzzFeed Motion Pictures president Ze Frank’s office — a prank by staffers for his birthday. Would Frank be angry? Would the goats escape?? Would chaos ensue?! Five of us waited for the grand climax, baffled by our own interest, along with 81,000 other viewers. One week later, BuzzFeed was at it again, lassoing the Friday afternoon bored-at-work Facebook crowd — including, the entirety of media Twitter — with a live video of two staffers putting rubber bands around a watermelon until the fruit exploded. This is the power of Facebook Live, the platform’s — and Zuckerberg’s — latest pet feature that allows users to pick up a smartphone and start broadcasting in real time to followers who happen to be scrolling down their Facebook feed at that moment, or who have subscribed to the broadcasts. Last week, ahead of its F8 developer conference (which starts Tuesday in San Francisco), Facebook introduced new features to help make Live a centerpiece of the platform. For some news organizations, Facebook Live is a natural extension of broadcasting operations, with a built-in audience of Facebook users who have liked that page. BBC News, for instance, has more than 28 million followers there. BBC News started experimenting with Facebook Live from within its newsroom, with news presenter Ros Atkins, who already hosts a “real-time news program” from London called Outside Source that covers social conversations around news stories of the day. 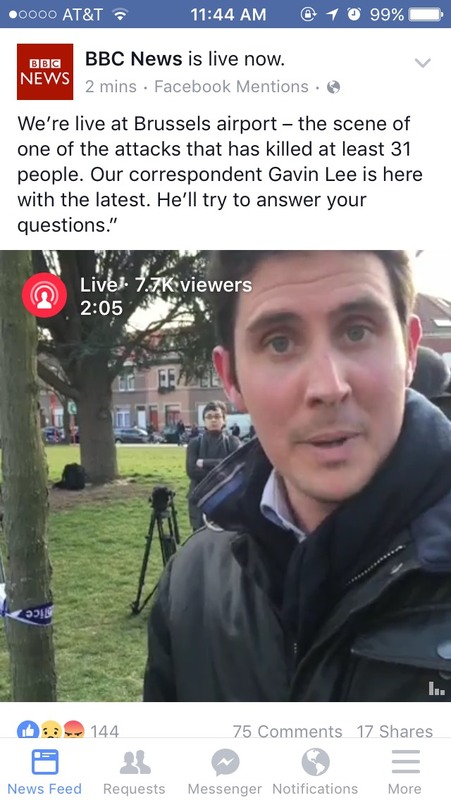 With its wealth of reporters worldwide, the BBC has been able to go Live from Brussels during and after the March 22 attacks, Live from Brazil with a clinic doctor answering questions about the Zika virus, Live from South Africa, Live from Texas, and so on (racking up thousands of comments on each Live video). Fusion is another organization with television roots, and AMERICA host Jorge Ramos has been an aggressive advocate/poster boy for how Facebook would like journalists to embrace its Live feature. As I scrolled through videos from Fusion’s Facebook page, I stumbled across its Live show from Cuba. It included multiple correspondents in multiple locations, had noticeably higher sound and image quality than most videos, and was well-organized, with a real ending, not one of those ambiguous cutoffs typical of Facebook Lives. 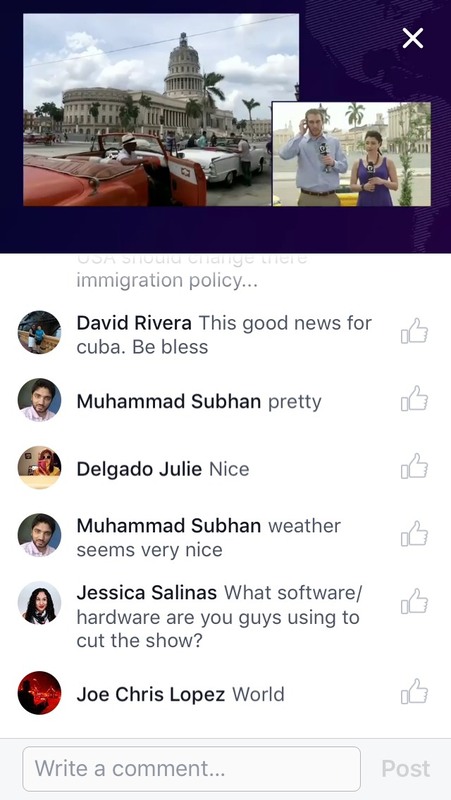 “Cuba was the first multi-camera Facebook Live for us. We’ve been collaborating with Facebook, and we were effectively able to produce a whole show and distribute it on Facebook,” said Dax Tejera, executive producer of AMERICA. “We originated the show from headquarters. 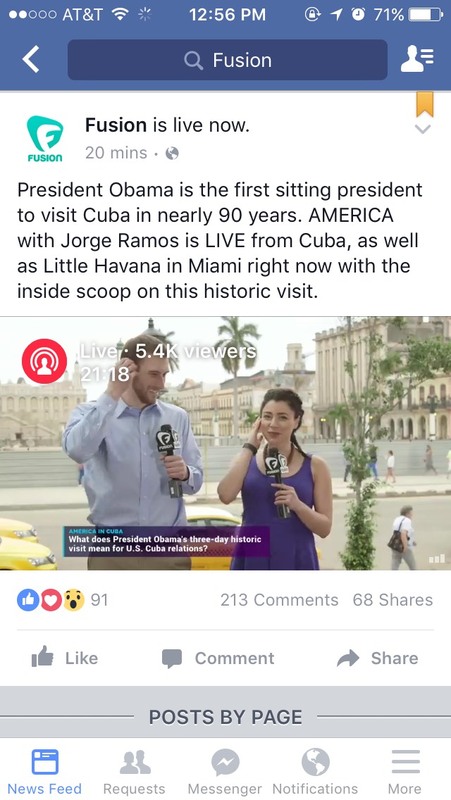 I was in Cuba, and we had a reporter in Little Havana.” The team set the Live show during the lunch hour to catch people at their desks, scrolling through their Facebook feeds. The Daily Beast is straddling that in-the-studio/in-the-field dynamic with two regularly scheduled shows. 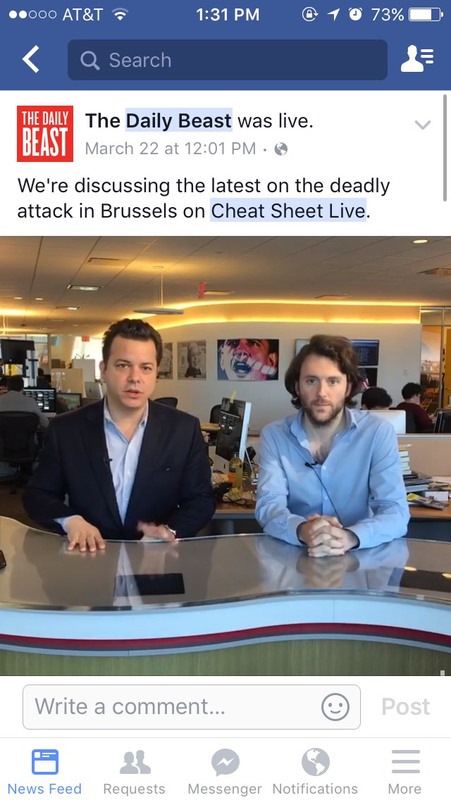 One is named after its Cheat Sheet daily digest and features editor-in-chief John Avlon sitting on a small set inside the newsroom discussing news of the day. The other, “Drink Cart,” features cocktails correspondent Noah Rothbaum making drinks and discussing culture on Friday afternoons. 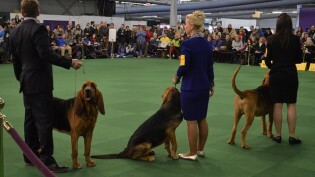 The shows perform respectably, capturing 20,000 to 30,000 views for around 20 minutes of in-depth chatter. “It’s one thing to have people on cable TV talking about what it all means, but it’s another to have experts engaging in real time as people ask very critical personal questions — about safety, travel bans, things like that — in a very simple, direct way,” Mike Dyer, Daily Beast president and publisher, said. The Daily Beast is training individual writers and editors how to broadcast from their iPhones, so they can go live any time they’re out in the field. “This opens up all kind of new ways and products to tell a story that are not so much focused on production values,” Dyer said. Everyone I spoke with was excited about the ease of going Live, and the quality and volume of comments beneath each video. 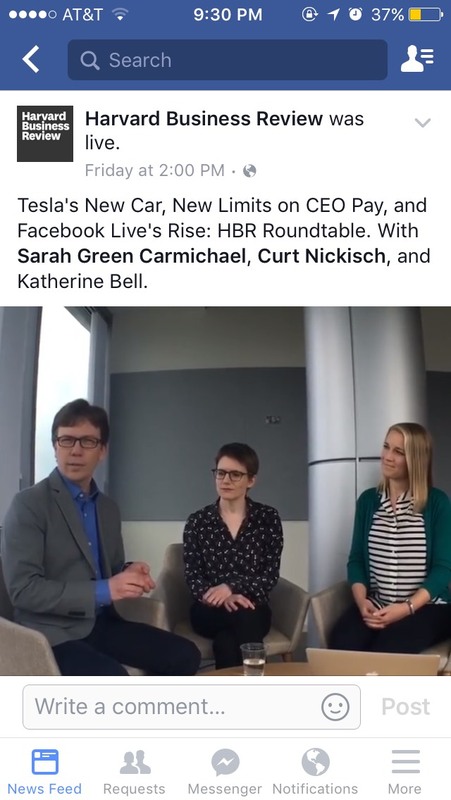 HBR’s live shows have centered around bringing in experts. In one, a Tuck School of Business professor gave a live lecture, whiteboard notes included. It got 73,000 views, 620 shares, and 328 comments. As simple as they are, these videos aren’t a matter of just picking up a phone. Challenges for outlets large and small include getting a consistent cellphone signal during Live broadcasts and somehow letting the flood of Facebook commenters know their questions were actually seen and not just thrown into the abyss. An otherwise fun behind-the-scenes with Meet the Press senior producer Shawna Thomas, for instance, was interrupted several times when Thomas lost signal in stairwells. The Huffington Post considers comments a multi-person operation: It has three-person field teams for primary coverage, including a host, a producer, and a shooter to handle the iPhone and audio. A fourth team member in New York follows comments and chats the best ones to the host in the field. Frankel of BBC News described a few different methods his team has tried with correspondents out in the field to handle comments. In Brussels, “we had our correspondent out with a producer, the producer had the phone on a stick, and the reporter was walking and talking and looking at his own phone, where we were WhatsApping him with the best of the comments,” Frankel said. BBC News has also had a reporter hold a tablet with a Google Doc on it. A producer back at the base filtered the comments, picked out the best ones, and added them to the Google Doc, where the presenter could look down occasionally to pick some out. POSTED April 12, 2016, 11:38 a.m.
Wang, Shan. "Live, local, late breaking: On Facebook Live, news outlets take a cue from TV (but don’t call it TV)." Nieman Journalism Lab. Nieman Foundation for Journalism at Harvard, 12 Apr. 2016. Web. 23 Apr. 2019. Wang, Shan. "Live, local, late breaking: On Facebook Live, news outlets take a cue from TV (but don’t call it TV)." Nieman Journalism Lab. Last modified April 12, 2016. 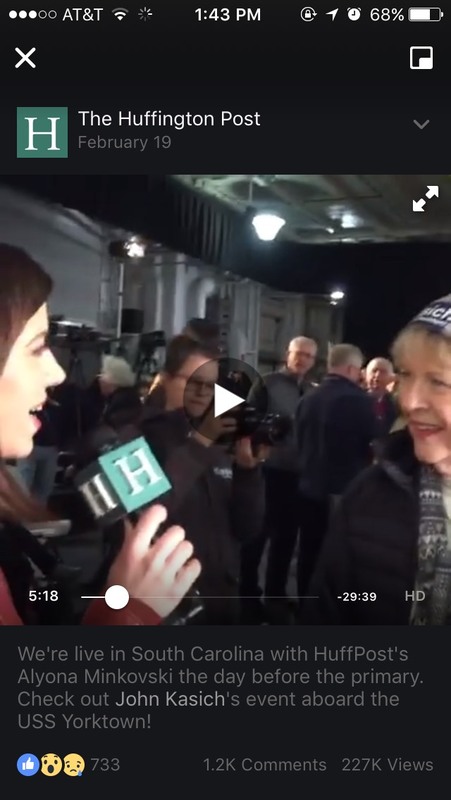 Accessed April 23, 2019. https://www.niemanlab.org/2016/04/live-local-late-breaking-on-facebook-live-news-outlets-take-a-cue-from-tv-but-dont-call-it-tv/.